As we head down the backstretch of month one in our marathon towards the finish line, even the most adamant of us that preach patience with our teams need to dust off the desk once again and start taking a look things. The season is easing into a canter and players are fast approaching the 100 at-bat mark meaning it’s easier for to analyze how our players are performing from the still smallish samples we have at our disposal. As the at-bat totals climb the rate statistics won’t be subject to such wild fluctuations with each 1-for-10 slump or 5-for-10 surge. The following article is less about making moves based on the past and more about shedding some light on what we might be seeing from a group of players in the coming month of May. I analyzed the past three years of data to determine who the top May hitters are during that stretch. I took everyone that posted an .850 or better OPS in May of 2005, 2006 and 2007. From there, I looked how frequently the players appeared. If a player appeared only once, they were done as I was looking for players that consistently smack the ball around in May. Performing in one of the past three Mays can be written off as a fluke. There were 45 players that hit the .850 or above OPS mark in two of the three seasons and you will learn about them very shortly. Eight of those 45 (18%) turned the hat-trick. The positional breakdown delivers 21 outfielders, 14 corner infielders, six middle infielders and four catchers/designated hitters. The point of this exercise is to shed some light on the players you can reasonably expect a surge from as the calendar turns over to May. It is by no means a guarantee that these players will perform in this May as they have in past Mays, but the data set is large enough to make it worthwhile (read: fun) to look at for fantasy owners. Also, some of the players on the list might be currently struggling and thus increase their candidacy for a buy-low trade. The bulk of this 45-player list is superstars and established players, so don’t expect a list of players you can troll the waiver wire for in hopes of riding a hot May up through your standings. If anything, this list was constructed to offer peace of mind to those worry easily in this game we play. A hot month can jump-start a season and erase a slow start. Heck, Ryan Braun didn’t even need an April to put together an MVP-caliber season last year. There are definitely some players in this list that are currently slumping enough to raise concern for their owners. There are sometimes various degrees of validity to slumps of superstars, but those are usually injury-related. So if your stud isn’t in the news for various maladies that could be affecting his performance, then he is likely just in a slump that he will assuredly come out of during the season. It could be May, it might be June, but as the adage goes: hitters hit. OK, enough preaching, let’s get back into some specifics about the list. A team breakdown suggests that opponents of Boston, Detroit and the New York Yankees had better watch out. Of course, I’d have suggested they watch out even without this list. Only seven teams don’t have a player within the list of 45 and the most surprising tidbit to come out of that fact is that one of the seven is NOT the San Francisco Giants (their representative will surprise you even more!) The light-hitting Kansas City Royals, Oakland Athletics and San Diego Padres are all on the list of seven to the surprise of no one. The lack of representation from the Tampa Bay Rays is actually a bit of surprise despite their ineptitude as a team in recent years. Though thinking through it now, their budding stars have not really been around long enough to have strung together a few Mays in a row. The Los Angeles Dodgers, Seattle Mariners and Texas Rangers round out the list of seven. For those keeping track, that is three-quarters of the American League West to make the no-show list. •	Note that I included the extra base hit percentage so you can get an idea of how many doubles and triples each batter had to go with the home runs that you can see listed. I found this to be more useful than keep the double & triple columns. •	Though .850 was the cutoff to qualify for the study, you will see that three of those ended up on the list actually have OPS below the .850 mark. Each of these three players had two seasons that qualified for the study, but clear their third year of May statistics took them below the threshold I was looking to achieve. •	Mike Cameron’s presence could bode well for his owners as he doesn’t even begin play until April 29th after serving a 25-game suspension for amphetamine use. 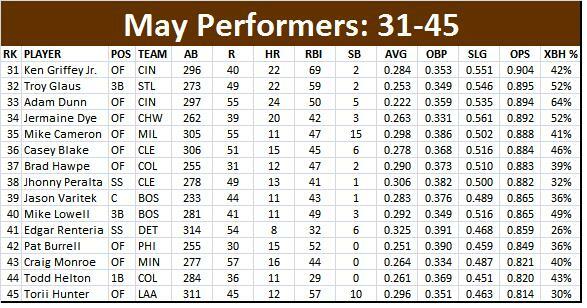 •	Though he made the list, Adam Dunn doesn’t necessarily heat up in May. He hits for a ton power and takes the walks that we expect him to take. Both of these outcomes inflate his OPS to give him a spot on the list, but factoring in the .222 average almost eliminates the goodness of the home runs and runs batted in. As always, in an OBP league Dunn is a monster! •	Pat Burrell is not getting much press because of superstar teammate Chase Utley’s play, but Burrell has been white-hot to start the season. He often starts off the season well, but not this well. Many are attributing his hot start to the off-season marriage and the fact that he is a contract year. •	Several of the players in the bottom third of the list would benefit from continuing this historical trend including Casey Blake (.233 avg), Troy Glaus (0 hr) and Brad Hawpe (1 hr). •	As mentioned earlier, Chase Utley is steamrolling towards a Player of the Month Award at April wraps up. He has 10 home runs and an absurd 1.280 OPS. If he puts up another strong May, the league is in deep trouble! 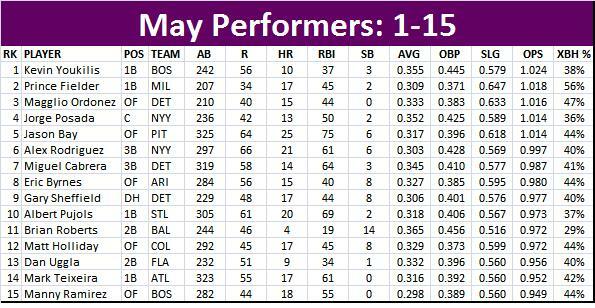 •	With a recent seven-game hitting streak from David Ortiz that has included three of his four home runs, he is heating up just in time to keep his hot May trend alive. •	Utley isn’t the only one on fire that cracks the top 30: Conor Jackson, Chipper Jones, Alex Rios and David Wright are all paying large dividends for their owners thus far. •	Lyle Overbay welcomes May with open arms. He has yet to hit a home run this year and he has six in each of the past two Mays. He is one of the eight players that posted an .850 or better in each of the three seasons analyzed. •	Nick Johnson is finally healthy, but uncharacteristically struggling in April. He is still piling up walks, but not much else. Finally, let’s look at the top 15. It’s star-laden with the likes of Alex Rodriguez, Albert Pujols, Matt Holliday and Miguel Cabrera, all of whom are 1st round picks/top-dollar players. •	Aging stars Magglio Ordonez, Gary Sheffield and Manny Ramirez do some of their best work in May. Ordonez & Ramirez are both on fire already, while Sheffield is banged up and struggling when he does play. •	A pair of second basemen cracked the top 15, but only relies on the long ball to power his fantasy value. Brian Roberts and Dan Uggla are overshadowed by Chase Utley (and rightfully so), but both join him and actually supersede him when it comes to May performance over the past three seasons. •	Jason Bay was a waste of draft picks and auction money for his owners a season ago, but when you look at the breakdown, May was his best month. He hit four home runs per month from April to August, but only twice did he top .695 in OPS. •	In the off-season, Albert Pujols’ elbow caused Y2K-like fear on the fantasy landscape. A month into the season, it has proven to be as innocuous as Y2K was some eight years ago. That said, his owners aren’t out of the wood yet. In fact, they won’t be until at least the All-Star Break. A primary source of the fear was centered around the fact that while he’d play and play hard while he could, he would shut things down at the first sign of pain. Provided health, he should continue his tear in May. •	Mark Teixeira, my pick for the National League MVP, is poised to breakout. He has raised his batting average by 40 points in the past week, but his home run pace is a little light at 30. Look for a strong May to propel to securing the Senior Circuit’s top player honors at season’s end. 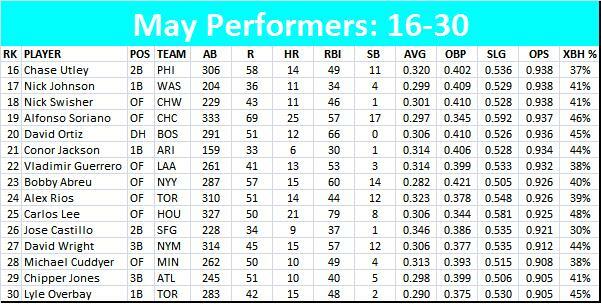 There are the Top 45 performers in the month of May over the past three seasons. Even though most of the players in the study topped 250 at-bats, it is still difficult to say whether or not performing well in a particular month year-in and year-out is anything more than coincidence. If you buy into study, you can use the data to acquire some buy-low candidates and wait for their breakout next month. If you’re skeptical about the validity of what you just read, you can still use the data to your advantage by flipping some of these players for more than they’re worth by citing their impending breakout in May. Wherever you fall on the spectrum, this kind of study is what makes baseball such a great game. We gather piles and piles of data and analyze to see if we have anything. If not, it’s back to the drawing board.